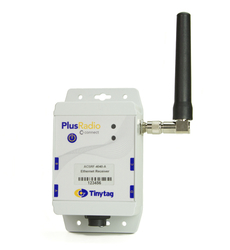 The Plus Radio Ethernet receiver is required as part of the Tinytag Radio Data Logging System. It controls the transmission of data to and from the radio loggers: data received from the loggers is then sent to the computer for viewing with Tinytag Explorer Connect software. If power to the computer running the system is lost, the receiver has a battery back-up which will maintain the mesh network until power is restored. This receiver plugs directly into a LAN removing the need for a computer in the area where monitoring is to take place. The receiver is powered using a plug-in Power over Ethernet adaptor which is supplied with the unit.